Umziki Chalets - Mkuze Accommodation. Set in the picturesque northern KwaZulu-Natal;Pongolapoort Dam. 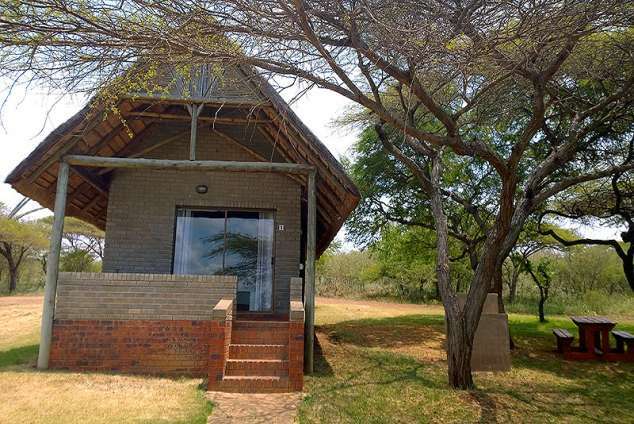 Umziki Chalets are found on the Jozini Game Ranch which along with Hlambanyathi Game Reserve belonging to the Senekal family covering a total area of 15 000 ha resulting in a variety of habitat types, animal species and record bird species. There are seven thatched chalets with two, three and four bed options, accommodating up to 23 guests. All the chalets are air-conditioned and have en-suite bathrooms. Linen, cutlery, crockery and domestic services are all provided. A central kitchen, lapa and swimming pool provides for recreational purposes. There are self-drive 4x4 drives through the game farm or alternatively bring your mountain bike or quad bike and see what you can see. Boat-hire can be arranged with our sister camp Nkonkoni Fishing Camp if tiger-fishing is your game or bring your own boat. Game drives in Hlambanyathi Game Reserve can be arranged for our guests. There is an option of catering if you don't feel like doing your own cooking. All you have to do when you get to Umziki is unpack put your feet up and enjoy the experience. Umziki Chalets is centrally positioned to many sort after destinations. One can take a day trip into Swaziland or go salt-water fly fishing at Kosi Bay..... The options are endless, with several KZN game parks and Maputaland jewels waiting to be explored, all within reasonable driving distance. 25378 page views since 02 Nov, 2007. Last updated on 26 Nov, 2018.